NC A pigmented filament of keratin which grows from a follicle on the skin of humans and other mammals. NU The collection or mass of such growths growing from the skin of humans and animals, and forming a covering for a part of the head or for any part or the whole body. (zoology) NC A slender outgrowth from the chitinous cuticle of insects, spiders, crustaceans, and other invertebrates. 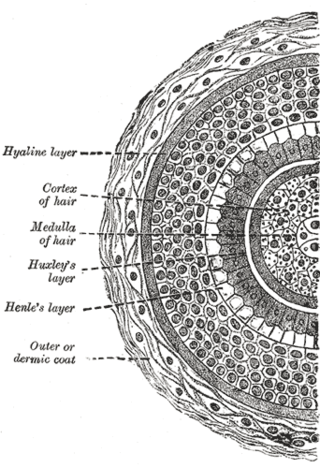 Such hairs are totally unlike those of vertebrates in structure, composition, and mode of growth. (botany) NC A cellular outgrowth of the epidermis, consisting of one or of several cells, whether pointed, hooked, knobbed, or stellated. OBS Haircloth; a hair shirt. NC Any very small distance, or degree; a hairbreadth. Because my hair often drops, I’ll zhush it up with my rotating brush. Anyway, to make a long story short, here was this young kin of mine dressed in a white shirt and shoes and pale blue shorts standin' there with his hair slickered down, starin' at me. His hair was thinning and slicked back, and he could have done with a good shave. Hair cells were more severely damaged in blood injected ears than in cochleostomy only ears. The suaku (literally "mountain tortoise" and figuratively "country bumpkin") sports a beer belly, fake brand-name apparel and oil-slick hair. Your mum will have kittens when she sees what you've done to your hair! Tired of her flat hairstyle, Vicki volumized her hair. Meaning of hair for the defined word. Grammatically, this word "hair" is a noun, more specifically, a countable noun and a singularia tantum.